When Aethertorch Renegade enters the battlefield, you get EnergyEnergyEnergyEnergy (four energy counters). 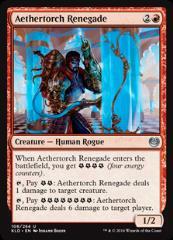 Tap, Pay EnergyEnergy: Aethertorch Renegade deals 1 damage to target creature. Tap, Pay EnergyEnergyEnergyEnergyEnergyEnergyEnergyEnergy: Aethertorch Renegade deals 6 damage to target player.